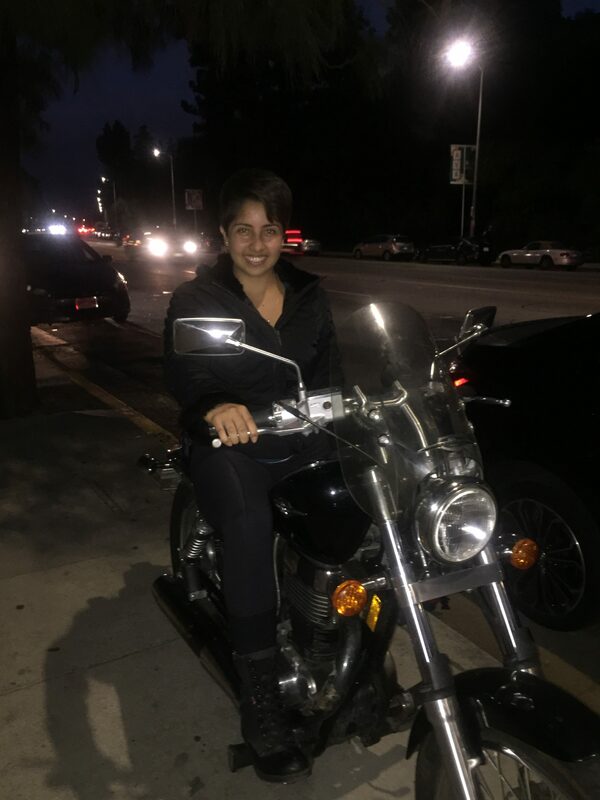 Hello all, in part three of my interview with Sabrina we discuss her fears, and learn about what she’s riding. T: Were you ever afraid or nervous about riding in the city? S: You know, I investigated everything. In the beginning I just wanted the license to always be able to go and rent a motorcycle in the dirt. Rent it for a couple hours and then go home. That was the initiative, so I wasn’t afraid. The moment I got a little nervous was when I went to buy my bike. I was like “okay I need to ride this home. I’m not going to walk it home.” That was the first time I said to myself “wait, I’ve driven cars before in this area, and thought some people need to go and take driving classes. Now, I’m not even a third of a size of those people on the road.” So, that’s the first time I got nervous. T: What made you overcome that fear? S: I just paid for that bike, I had to get it home. So, I did it! T: When you got on did the fear go away? S: Pretty much. I knew the streets to get home without highways. It was in Burbank, literally eleven minutes from my home. So, the neighborhood roads were pretty empty. If I needed to calm down I could go to the parallel roads and it would be pretty empty. So, that was good. T: What kind of bike did you buy? S: I bought a Suzuki S40. It’s a Suzuki Boulevard, a cruiser. I really like it. T: What made you choose this bike? S: I knew because I learned with my older male cousins, that I wasn’t afraid of going faster. I knew that buying a 250 wouldn’t allow me to go too fast. And when my mom first taught me to drive she told me ‘Sabrina just drive slowly, get to know the car.’ So, for now I just got a 250. I also wanted to look a little cool. I think that’s a part of having a bike. It would be a great bike to learn on. The man that had the bike actually bought it for his daughter. She rode it for a couple months, then she went to college in Texas. The bike had sat for five years, he wasn’t going to ride it. When I saw the bike it was in perfect condition, and I was like, “this works for me!” The owner took good care of the bike and he showed me how he took care of the bike. Thanks for reading along. I hope you’re enjoying this interview as much as I did.